After some deliberation, I decided I needed a saw bench first, in order to get some progress going on the rest of the shop rebuild. So I’m prepping the wood right now. This was originally 2″x12″x8′ material I’d hand selected and then stacked and stickered in the garage over a year ago for building a workbench. I don’t need that much of it anymore, since I’ve decided to take a different route for building the bench top and legs. In any case, it is pretty darn dry at this point, so I don’t expect a lot of wood movement. Plus, as you can see, I picked my boards with center pith (which I’ve cut around) to give me a lot of quartersawn material. Smart, eh? I did some wringing of hands for a while, wondering where I was going to find 1 1/2″ material for the bench (which is what the plan I’m looking at called for). Finally, I said, “Just build something, dammit!” and grabbed a board and marked out some rough measurements and went to work with a rip saw and a cross-cut saw. Then I spent an hour or two with my jack plane and a smoothing plane. End result? Four legs, two stretchers, and a top. I’ll have to build another before I’m done. A pair of saw benches means a place where I can crosscut and rip material easily, which is a must since I’m trying to reduce tablesaw usage. It will come in handy when I’m squaring up my bench top material, which I hope to be acquiring soon in the form of some 8′ long 6″ x 6″ pine beams. 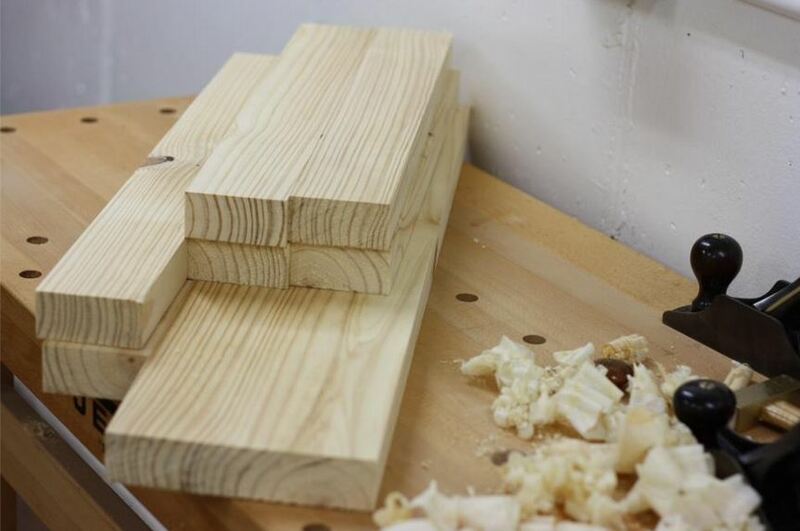 The extra thickness of the top will mean two things – some really beefy joinery, if I decide to go with through-tenons, and that I’ll have to do some relief boring (about 2″) from the bottom on my bench hook holes if I want them to hold properly. And I’ll go ahead and use this material for the legs, as well, which means this thing should be pretty darn solid. That’s good, because my left foot is tired of hooking the bottom bench rail to try and keep it in place while I handplane on my current crappy bench. Although, I must admit it is building some muscles I didn’t know I had. On the matter of counterboring; I built my benchtop from 6×6 nominal material. I drilled a row of dog holes (not counterbored), and then put in one central holdfast hole (counterbored). I really haven’t noticed much if any difference between the wholes for holding power. More important is that the holes are as square as possible to the top so that the holdfast can grab at 360 degrees. Some of my holes only work in certain directions because of the nature of the spring mechanics and the holes are tipped one way. Man, I wish I lived someplace where I could pick up nominal 6″x6″ material (that isn’t pressure treated). Eh… actually, there are one or two local sources I haven’t tried yet. But I’m rather itching to try and make it from recycled material at this point, so I believe that is the route I’ll take. Still, might be worth checking out in case the recycled beam idea doesn’t work out. Thanks for the tip, Simon! I’ll have to figure out a way to make sure my holes are dead straight, especially since I was thinking about boring them with bit and brace. I was purposefully vague here with the time spent planing. About half way through, I realized I needed to sharpen the blade on my No. 5. And when I pulled the blade out of the plane, I noted that I’d not really done much “fettling” with the plane and that it could do with a quick tune-up, at least where it was most important, so I could get back to the saw bench parts (I’ll give it a proper tuning in a few weeks, when I’ve had a chance to view Chris Schwarz’s new DVD a few times). So I gave the iron cap a quick lapping to tighten up the joint between it and the blade. And then I took a mill file and fixed a little nubbin on the mouth where I noticed shavings were catching. And I scooted the frog back a tidge to widen the mouth. THEN I sharpened the blade. So all that extra work added some time to the job and I lost track of how much time I spent planing and how much time I spent fudging with the plane setup. Anyway… thought I would explain the larger span of time indicated. Been meaning to tell you, thanks for backing me up on “just get to work and get something done!” I’m glad to see that you are still working at things, keep at it and work hard! BML is one of my favorite blogs. 🙂 Your writing is as inspirational to me as your woodworking. Happy to help put such sentiments forward.